What a scrumptious delight of a movie! Love and Friendship adapts Jane Austen's juvenile novella, "Lady Susan." (Not "Love and Freindship" [sic].) I'd wanted to see it anyway, but one of my project managers raved about how good it was. It wasn't showing at the Alamo, but I enlisted a friend and drove across town to a Cinemark. As it turned out, she'd seen it last weekend but was quite willing to see it again. Kate Beckinsale sinks her teeth into the role of Lady Susan. I've mostly seen her in action movies, so I had no clue she had this in her. Lady Susan is a tough character to play - she's a terrible person, but one you end up rooting for because she's the protagonist. But Beckinsale plays her to a tee, the way she can perceive any situation in her favor and twist the truth so sprightly. And, well, she's does have a point. She's a penniless widow with a daughter who needs a secure future. She's playing the game. She's just more underhanded about it than Austen's future, more famous heroines. The plot is slight, but that works for a movie. (After all, many of Austen's other works require a miniseries to be told well.) There's a decent-sized cast, but everyone is clearly introduced with title cards. And what a cast! Chloe Sevigny is hilarious as Lady Susan's equally amoral best friend, a married American on the outs with her husband. Tom Bennett steals the show as the rather dim Sir James Martin. 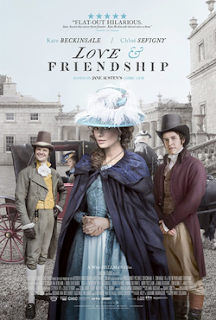 Love and Friendship stops dead two or three times to let him babble on, and the movie is better for it. His digression on the twelve commandments is a bauble of comic genius. Love and Friendship also does a good job of presenting the complicated morality of the story. Lady Susan's sister-in-law and her parents are concerned that Lady Susan is abusing her daughter. Her daughter does blossom when free of her mother's plans to marry her off, but seems to generally feel that her mother showed her love the way she knew how. It does have some faults. "Lady Susan" is an epistolary novella, and it shows. A scene will start, then cut to Susan telling her friend what happened. Beckinsale sells it, but sometimes it might've been nice to actually see the plot unfold. You don't have to be an Austen fan to enjoy Love and Friendship. You just have to be a fan of dry humor and the comedy of a group of good people running into someone who is shockingly terrible.